Termites are an incredibly common all over the country, including Queen Creek, Arizona. Not only is an insect infestation pretty gross and unwelcome, but termites specifically can severely damage the materials that compose your home or business and can compromise the integrity of the building’s foundation. There are several common signs of termites infestations that you can identify on your own before looking into an exterminator. Take a tour of the outside of your home or business. If you find a long log of compacted mud, sometimes as long as several feet, it could be a sign of a subterranean termite infestation. These tubes of mud run up from ground and past the foundation of the building and serve as the termites’ means of travel. Mud tubes also provide moisture for a comfortable ride. Mud tubes are often found several at a time and allow termites to create pathways between water sources and food. That food being the wood that composes your house. Termites will swarm after a heavy rain. This is especially common during the monsoon season in Queen Creek. Flying termites are in their reproductive stage and are ready to mate and produce more annoying little house eaters. If a swarm is in action near your home or business, there’s a good chance that these bugs have hatched somewhere close. Search for tiny wings that may be strewn across the grown. If you are present during a swarm, trying to catch a few of the flying termites to give to an exterminator. A pest control specialist can then analyze the type of termite that may be infesting your home or business and can decide how to properly do away with them. Termites eat wood from the inside out. Check the exposed wood in your basement or outside of your house for signs of termites. Since holes will not be very obvious, look for displaced dirt near the base of a beam or wood pillar that usually isn’t there. If there are unusual cracks near the surface of the wood, termites may have gutted the wood and it is beginning to deteriorate from the inside out. You can also take a pen and tap the wooden beam. If the sound from the wood is hollow, that beam was probably a tasty snack for some termites and tunnels are likely present inside of it. Drywood termites are common in Queen Creek along with subterranean termites. Drywood termites can drill little holes that are so small that the naked eye cannot detect them. However, drywood termites will kick sawdust and droppings behind them during their rampage. This sawdust will be present around the wood and in little piles beneath it. Check wooden furniture as well as wood baseboards and pillars around your home for these tell tale termite signs. A professional termite inspection from a good termite and pest control company in Queen Creek should always follow your own termite inspection. A quality company like Varsity Termite and Pest Control can analyze exactly how bad your infestation is and will determine the next best course of action to remove termite from your home or business. Absolutely! There are many do it yourself products available that can be used as trenching treatments to keep termites from getting into your home. Many of these products boast applications that can last nearly five years. However, a trusted pest control company can often provide great products and apply the treatments for you. Who can help me with my termite problem? When termites have made their presence know, you won’t want to waste your time and money on a termite control company in Queen Creek that does not do the best job. 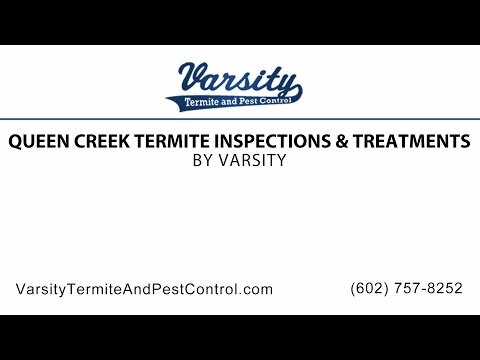 Varsity Termite and Pest Control offers the best service to the Phoenix and Mesa Arizona areas. Varsity Termite and Pest Control believes that customer satisfaction should be the number one priority in the pest control industry. After all, it is your home. With twenty one years of experience under their belt, Varsity Termite and Pest Control in Queen Creek has the expertise and experience to get the job done and get it done right. Solve your termite problem today and give Varsity Termite and Pest Control a call.